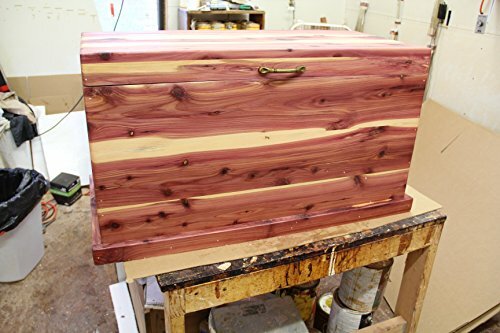 Cedar chest, hope chest, blanket box, bedroom furniture, toy chest, trunk, living room furniture by Rusty's Woodworking at Indsight. Hurry! Limited time offer. Offer valid only while supplies last. Listed is a cedar chest that measures 36'' long by 16'' wide and 20'' tall. It is made from all cedar wood. The sides, top and bottom are 7/8'' thick. Listed is a cedar chest that measures 36" long by 16" wide and 20" tall. It is made from all cedar wood. The sides, top and bottom are 7/8" thick. The inside area of the chest measures 34" long by 14" wide by 16" tall. The chest is finished with tung oil so you can have the beauty of the wood show. The inside is unfinished to give the cedar protection and the cedar smell. The chest pictured has been sold. My orders are made as they are placed. If you have any questions about this product by Rusty's Woodworking, contact us by completing and submitting the form below. If you are looking for a specif part number, please include it with your message.